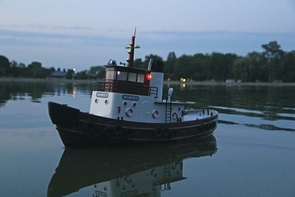 This is the electric powered radio controlled Ready To Run AquaCraft Atlantic II Harbor Tugboat. 4 AA batteries (8 for the transmitter and 2 for lighting system), 11.1V at least 2200mAh with Dean's Ultra plug battery and charger. Husband loves the RC boat! Thank you. Cruise the seas in style this season and feel like a real tugboat captain with this outstanding quality radio control tugboat.